There are only 81 Southern Resident orca whales in the wild, so when there are five new additions this year it’s a pretty big deal. Capturing them in some incredible photos is another amazing thing altogether. 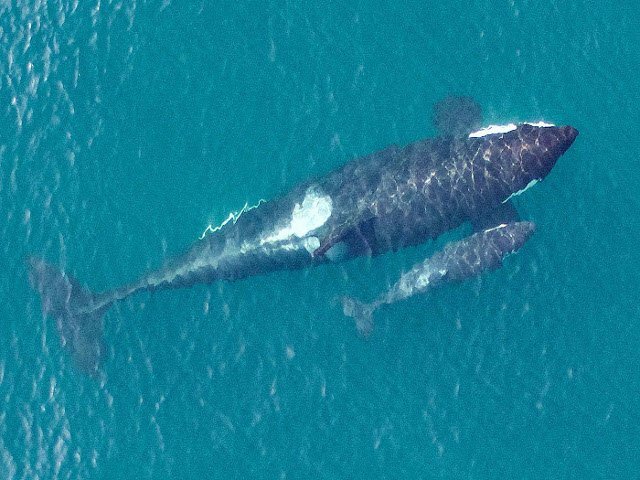 In stunning photos shot from an aerial drone in the San Juan Islands outside Seattle, Washington, pods of killer whales were seen travelling in family groups with mothers nursing calves and fathers travelling alongside. John Durban was one of the marine mammal biologists with NOAA Fisheries that helped capture these amazing images om collaboration with the Vancouver Aquarium. Not only are the images wonderful for people to enjoy, they also play a role in research, explained Durban in a podcast about the photos. Using the photos, biologists are able to take extremely accurate measurements of the size of the whales. While most of the orcas appeared in good health, some of the females appeared lean, possibly as a result of giving birth and weaning their calves. In one shot an image shows a killer whale eating a salmon. In others you see a calf suckling for milk with some of the rich liquid trailing behind. “It’s a great example of the kind of nurturing and close care that goes on between a mother and a calf,” Durban said. In order to capture the images, the aerial drone stayed at least 90 feet above the animals in accordance with Federal Aviation Administration rules. “It certainly is the first time we’ve seen it with this clarity,” Durban said. “Previous attempts to photograph from the air, we’ve been in manned aircraft, like helicopters, so we’ve been a lot higher, so we’re getting this kind of detail. So this is the first time we’ve seen this kind of behavior in this kind of clarity.